[IWP news release] An IWP professor is part of the now-famous ‘Team B’ report on enemy threat doctrine and operations, including the Muslim Brotherhood penetration of the United States. Annenberg Professor of International Communication J. Michael Waller joins a range of noted defense, intelligence and security experts as a contributor to Shariah: The Threat to America, a new bipartisan report published by the Center for Security Policy. “Team B” refers to the 1976 “Experiment on Competitive Analysis” commissioned by then-CIA Director George H. W. Bush. The purpose was to expose to critical scrutiny the assumptions and factual basis underpinning the official assessment of the totalitarian ideology that confronted America at the time: Soviet Communism. The official US government assessment was rooted in the belief that, through “détente” engagement with the USSR, the West could not only avoid nuclear war, but peacefully coexist permanently with the Soviet regime. DCI Bush invited known skeptics about détente to review classified National Intelligence Estimates and other data concerning Soviet objectives and intentions, and present and future military capabilities. His purpose was to provide an informed second opinion on US policy. That group became known as Team B, with Team A being the Ford Administration and the intelligence community in general. The Team B assessment provided intellectual fuel for Ronald Reagan to be elected on a platform committed to confronting the USSR and ultimately to developing a strategy to dismantle the Soviet empire. Today’s second “Team B,” led by retired Lt. Gen. William G. Boykin, a former deputy undersecretary of defense for intelligence; and retired Lt. Gen. Harry Edward Soyster, a former director of the Defense Intelligence Agency (DIA). 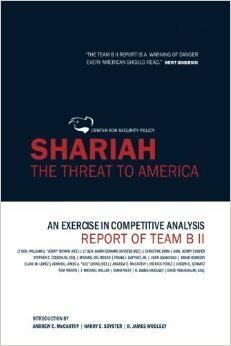 Known as Team B II, the group issued a report on September 15 that details shariah – what the report calls “the crucial fault line of Islam’s internecine struggle.” Many Muslims view shariah as a set of moral guidelines for leading a virtuous life. But others, known as Islamists, view shariah as a socio-political code that must be imposed on all as a form of government. It is this latter view of shariah that Team B II considers a “threat doctrine” that the US must challenge – both abroad and here at home. “The report brings together former FBI agents, former federal prosecutors who put terrorists and enemy agents in prison, former Pentagon and homeland security officials, a former CIA director, and scholar-practitioners to paint the first comprehensive report that defines the enemy in today’s major conflicts,” Dr. Waller says. In addition to teaching at IWP, Waller serves as Vice President for Information Operations at the Center for Security Policy, which produced the report. The main vehicle for infiltrating shariah ideology and practices into the United States, the report finds, is the Muslim Brotherhood, a totalitarian, supremacist movement founded in Egypt early in the 20th century, which itself does not generally engage in violent jihad, but which has provided the ideological backbone for many of those who do, including al Qaeda. The report differentiates between violent jihadists of the terrorist type, and the “pre-violent” jihadist of the Muslim Brotherhood strain. The report is available on Amazon.com. Professor Waller joins a range of defense, intelligence, counterintelligence, law enforcement, homeland security, and war of ideas experts, including senior former officials, as a member of Team B II. In addition to being a contributor to the report, he served as one of its final editors and has prepared a 30-part serialization appearing on BigPeace.com. The Muslim Brotherhood immediately attacked the report on its website. The Team B II report has helped change the debate about how to combat Islamist extremism inside the United States and overseas, moving the frame of reference from a focus on violent terrorists to pre-violent subversives. The report also provides the most comprehensive report to date on the Muslim Brotherhood’s political, legal and social infrastructure in the United States, with specifics on its propaganda networks and front groups.